Back at the Ranch: Apple Harvest Time. And Pie. As it says in the Book of Ecclesiastes, "All things have their season, and in their times all things pass under heaven." Unless I'm mistaken, this refers to apples. Because of their chilling requirements, apples are generally a cold-climate fruit, but there are varieties that will grow and fruit in the Desert Garden. Anna, Ein Sheimer, and Dorsett Golden are all low-chill apple varieties with a good track record in the low Desert. I've grown Dorsett Golden here at the Ranch for any number of years with great success. There are trade-offs in growing the apples that grow here. None of them are what are called "keepers," and all of them ripen around mid- to late-June. What that means practically is that you will end up with a tree full of fast-fading apples hanging around in 100° weather. Once they're ripe, you must pick them then or they'll be gone; they have their season, and it passes quickly. When it's a hundred degrees out, tomorrow is too late. If you find that year after you year you don't get to your apples and they all rot on the tree, then your best course – and I hate to say it – is to pull out the tree and replace it with something you'll use. So let's say you do get all your apples picked. Now what? The first step is to rinse them in cool water or hold them in the 'fridge for a while to dissipate the field heat, or they will go bad before your eyes. You can only eat so many fresh. You can give away a lot. Every year I decide I'm going to put up apple sauce, and most years I decide that canning apple sauce when it's 110° is insane. Which brings us, inevitably, to pie. Apple pie. Pie is, as they say, as easy as pie. So why don't more people bake pies? The crust. Surveys have shown that when asked why they don't make pies, 8 out of 10 people will say they don't know how to make crust. The other two will ask "who are you and how did you get in my kitchen?" Unless you have ambitions to be a pastry chef, go buy ready-made pie dough at the grocery. It comes rolled up in a cardboard box, the store brand tastes better than the name brand, it's cheap, and it's better than most pie dough I've ever made. This may be the only time I ever recommend buying a food item ready-made. So here's the easy part: preheat your oven to 350°. Set out your box of crust so it comes to room temperature. Melt one-half of a stick of butter. In a small bowl mix one-half cup white sugar, two tablespoons brown sugar, two tablespoons cornstarch, one teaspoon cinnamon and one teaspoon ground ginger. Peel, core, and quarter a bunch of apples, enough to over-fill your pie plate, probably 9 to 12. Cut them into one-inch or less chunks; pretty doesn't matter. Put the apples in a big bowl, drizzle the butter over them, add the sugar mixture and toss to coat. Unroll one crust and press it into the pie plate. Glass pie plates are best. Dump the apples on top. Unroll the other crust, lay it on top, and tuck the edge under the edge of the lower crust, pinching them to hold them together; again, pretty doesn't matter. With a sharp knife, cut a few vents in the top crust. Lightly spritz the top crust with a 50-50 white vinegar and water mix, then sprinkle the crust with one to two tablespoons of white sugar. Don't skip the vinegar and sugar step; it makes a big difference and no, you can't taste the vinegar. Pop the pie in the oven and bake it for one-and-a-quarter hours, turning it once, half-way through, then cool on a rack. You have pie. Side note: of course you have a spray bottle of 50-50 white vinegar and water in your kitchen. It's under the sink. You use it to wash windows because it works better than all that expensive purple and blue stuff. See how easy that is? If you have a lot of apples, make a lot of pies. Give them to friends and neighbors and co-workers. They will be impressed and possibly touched; over the course of a bland lifetime of monotonous routine, you may be the only person ever to give them a pie; they will remember you in later years. Personally, I favor apple pie as breakfast food; it contains most of the major food groups: fruit, sugar, butter, and wheat. Add vanilla ice cream (cream and eggs) and it becomes the perfect nutritionally complete food with which to start your day. You'll notice from the photo that some of the leaves nearest our quince are a bit brown. I haven't identified any specific pathology causing the browning and drying, and I've noticed the same pattern of browning on the apple tree over the years; apple and quince are closely related. There may be a specific cause; it may even be a "treatable" cause. But as both trees continue to grow, thrive, and produce fruit, it's probably not worth worrying about. It may have something to do with the fact that the high temperature in this little slice of the Desert Garden has been over 110° for at least the last 10 days. Once it's been 10 days, it's best to stop counting. Think about that for a moment: our quince is in full sun and, while adequately watered, is subject to brutal temperature and light levels. If we were to pluck the little fruit off the tree and set it on the ground, it would be shrivelling and discolored by the sun within hours. Yet while attached to the tree by it's tiny stem, it does just fine and continues to grow and mature. We tend to get worried about the little things that happen to our plants, while the truly amazing thing is that any of them manage even to survive. I bought a pomegranate tree about 3 1/2 years ago, it is now about 6 feet tall, it has beautiful red flowers right now and no fruit. The tree goes dormant in the winter. Will it ever have fruit? If I buy another pomegranate tree what kind should I buy? I like the traditional fruit. Pomegranates can sometimes be a bit slow to grow and fruit, but once it reaches three years in the ground and 6 feet tall, I would expect a fruiting pomegranate to be bearing. You don't mention whether the flowers are single or double; if they're double, then it's likely that you have a fruitless variety, but some single-flowered types are also fruitless, so that's not an absolute. As you know probably better than I, the area around Whittier has an interesting climate. While you're heavily influenced by moderating maritime conditions, you also have a certain amount of more extreme weather coming from the inland areas. In the areas more heavily influenced by cooler coastal conditions, even fruiting pomegranates will often fail to set fruit; it really depends on the microclimate. Since you like the traditional fruit, buy a variety called "Wonderful" from a reputable local nursery. There are seedling-grown pomegranates that may have the same flower appearance without the same fruit characteristics, so buying from a local nursery that you trust is key. I suspect you'll find that your current plant is a beautiful but sterile variety and that "Wonderful" will produce the kind of fruit you want. At the worst, you'll have twice as many beautiful flowers as you do now. I am not a gardener, but my goal this summer is to grow a few herbs and see how I do. I thought a couple of small pots on my back patio might be the easiest route to go. I have found some conflicting advice on the Internet about what I could plant. Here’s what I wanted to start with: chives and basil – what do you think? If you could get me started, hopefully my experience will grow from there. You're in luck: in the Desert Garden you can grow almost any culinary herb worth growing. Many of our best herbs are Mediterranean in origin, which means with a little bit of care they tend to thrive in our hot and dry environment. 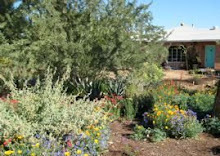 Just glancing out the window here at the Ranch I can see Lavender, Rosemary, Oregano, Marjoram, Summer Savory, Epazote, Bay, Italian Basil, Thai Basil, Thyme, Chamomile, Mint, Sage, and Petunias. Petunias aren't herbs of course, but they volunteered all over the herb garden and seem to get along well. As you can tell, there's no doubt that you can grow herbs in the desert, and Basil and Chive are excellent choices. The more critical part of your question is really whether growing them in pots is the easiest route. I will admit to a certain bias against growing plants in pots in the Desert Garden, primarily because of the realities of our Summer weather, and the care and attention that can require. As you consider putting plants in pots, keep in mind that as our temperatures soar above 100°, soil temperatures in your pots will also rise. Hot soil combined with the limited water-holding capacity of pots can be very hard on plants. More sensitive plants, especially those in full sun, may require water twice a day or more in order to stay alive. If you do use pots, consider using large pots with lots of soil, and try to keep your potted plants out of mid-day sun. Both Basil and Chives will do well even planted now. You'll want to buy started plants at this time of year, rather than growing from seed, and move the plants gradually into bright outdoor light, so they have a chance to adjust. Morning sun exposure, and bright light or very filtered sun the rest of the day is ideal for both. Don't let the plants dry out completely, but don't keep them soggy either. Basil will tell you when it needs water by wilting slightly; try to time your watering so that it gets moisture just before you see the wilting leaves. For planting a more extensive herb garden, Autumn is the best time for planting. The combination of warm soil and cooling air temperatures is perfect for establishing the plants. If you have the space, try to find a spot for your herb garden that will have filtered shade mid-Summer and 6 to 8 hours of sun the rest of the year; under a deciduous tree can be a good spot. Most of your herbs are perennials or sub-shrubs and will go for years. Basil is a tender annual, and will generally freeze dead in the late-Winter frosts; replace it in the spring with new plants or scatter seed around and let it grow. I have Basil that has been volunteering in the garden for years. You can plant a very formal herb garden if you wish, but I take a pretty casual approach and let everything jumble together. Many herbs do tend to sprawl as they grow, so keep them about a foot apart as you're planting but then let them grow as they will. As long as they get enough water to keep them from wilting and failing, herbs will pretty much thrive on neglect. And you get to eat them. I read your article titled Unhealthy Obsession: Pruning Trees which prompts me to ask, how is one supposed to prune in preparation for monsoon storms? In April of 2006, I planted an Ironwood, a Palo Brea, and a Guajillo, which I'm training to be more tree than bush/shrub-like. In October of 2007 I planted a Palo Verde, and a Foothills Palo Brea trees. They're all under 7 feet tall and the last two are under two feet tall. None are staked. I water deeply 2-3 hrs, every two weeks (in summer) per your guidelines. The 2 small trees are watered for shorter periods and at more frequent intervals – until they're established. Is this correct? I'm uncertain how to prune correctly to ensure I don't lose them to monsoon winds, but prune conservatively as you recommend. Only the Ironwood, Palo Brea and Guajillo have been pruned. I pruned primarily to remove branches which crossed, grew vertically downward, and would create a safety issue or eventually be too low to walk under. The Palo Brea is my biggest concern because it's developing nicely, but with a wide canopy I fear will flail wildly during the monsoons. I know NOT to 'lion-tail' trees and that isn't the look I want to achieve anyway. I want them to grow naturally so they ultimately become beautiful focal points in my desert-landscaped yard. I DO want them lush with full canopies, but how do I prevent them from being toppled when they're still so young? Thanks for the question and for providing such detail. I think I could teach people how to care for trees just by telling them "Do what Karren does." Planting small trees in the Spring or Fall, not staking, watering deeply, and pruning only as necessary, are the best steps you can take to make certain that you have healthy, vigorous, and storm-resistant trees. From what you describe, I wouldn't worry about your trees making it through the monsoon season storms. Trees suffer blow-down for two main reasons: because they have a weak or unbalanced canopy structure, and because they have a weak or shallow root system. Correct pruning takes care of the former, and correct watering takes care of the latter. So, let's look at the details. Planting small trees is the first correct step. Small trees, in containers of 15-gallon size or less, are more likely to have a good balance between the root system and the canopy size. If a tree's canopy is too large for the root system to support, then blow-down is likely and staking becomes necessary. Staking causes its own problems; trees develop strong trunks by swaying in the breeze and incorrect or over-long staking can prevent the trunk from becoming sturdy. It's not uncommon for staked trees to fall over once their stakes are removed. Next comes water. This is the one area where you might check to be certain you're doing things correctly. All trees, regardless of size or variety, should be watered to a depth of three feet every time they're watered. The idea here is that we want the roots to grow down deeply into the soil to anchor the tree. Most roots won't grow any deeper than three feet, so watering more deeply is a waste. You can use a soil probe to check how deep your water is going. The next element to preventing blow-down is to water widely. You want to be certain that your trees have wide root systems that anchor them into the soil. One of the chief causes of blow-down, especially with Mesquites, is a very narrow root system supporting a wide canopy. Think of your watering pattern as a donut with the tree in the middle of the donut hole. You want your donut's inside and outside edges to be several feet on either side of the drip line (the edge of the canopy). So, while it sounds like your watering time is probably good, do check the depth and the width. And, at last, comes pruning. They key here is to go slow and steady. All of the trees in your list are native desert trees with naturally low-breaking or multi-trunk forms. As you prune them up to form a higher canopy, continue to do it slowly, over a number of years. Lower branches on trees help to form a strong and sturdy trunk. If we prune off too many lower branches all at once, the trunk stays thin and spindly, and the trunk is unlikely to ever gain the girth that is needed to support the canopy. As you prune up, your ideal is to "clean" no more than 18 inches of trunk a year, less when the tree is quite small. Leave those branches to develop the thick trunk and you'll have a strong and sturdy tree. As always, we can do everything perfectly and nature still might throw us for a loop. One of the characteristics of monsoon-season storms is the occasional micro-burst; if your tree gets hit with one of those, it's going to go over. But for now, don't worry about it. If it does happen, it will make a good story, one that with careful management can get even better over the years. As happens this time of year, the weather in the Desert Garden is suddenly really hot. The thermometer aside, there is always that one day as we inch through the calendar when we realize that Summer is here to stay. One of the questions I'm asked most often this time of year is, "How often should I water?" The only accurate answer, as frustratingly vague as it may be, is, "Deeply, but infrequently." There are general guidelines and recommendations, but to water effectively and efficiently you need to spend a little time looking at your own garden and landscape to see how the plants are responding; the combination of plants, sun, shade, soils, heat, etc., is in every garden unique, and your watering will reflect that. For our quince here, watering to a depth of three feet, as wide as the drip line, every two weeks, has seemed to work well. Last week though, I noticed some slight wilting on the leaves. That wilting — and any wilting for that matter — means that the water demand from the plant is higher than the rate at which the plant can draw water to meet that demand. For a healthy plant, such as our quince, that often means a lack of soil moisture, but that isn't always the case with every plant. Wilting, remember, only means that the water demand is higher than the plant can meet. There are a number of possible reasons why the plant can't meet the demand: too little water in the soil, too much water in the soil, rotted roots, mechanically damaged roots, a disease of the xylem (water-carrying tissue), or simply a very hot day with a high evapo-transpiration rate. Before watering a wilting plant, first consider checking the soil for moisture, especially if you've watered very recently. We kill more plants in the Desert Garden through over-watering than by under-watering. As an example, if you're growing squash or another large-leafed cucurbit in your garden this Summer, you will notice that the leaves wilt mid-day. That's just what they do. If you water every time you see that wilt, you'll rot out your roots in no time flat. Instead, get your finger down under the mulch and into the soil; if the soil is damp, hold off on the watering and you'll see the plant bounce back in the evening. As it turns out, when I poked my finger down in the soil under the quince, it was dry. That means with the hot weather arriving, every two weeks is insufficient. I now have it scheduled for about every 10 days, and I'll keep an eye on it to make sure that works. Given the choice between eating a worm and eating a juicy, sweet, sun-ripened plum, I will almost always choose the plum. I suspect many of you feel the same. Birds, as it happens, agree with us. I wouldn't mind birds eating the plums if they were content to eat a certain portion of individual fruits, even a large portion. Birds, however, take more of what I think of as a hard-to-please Goldilocks approach, sampling a little bit of every single fruit they can reach and never finding one that's just right. If you grow plums in your slice of the Desert Garden, or any other soft fruit, you'll want to protect them from bird damage. Birds have an uncanny ability to know exactly when the fruit is almost ripe, and will start pecking it to pieces. While some gardening books suggest you should harvest the fruit early to avoid bird damage, and then allow it to ripen off the tree, that's not a satisfactory approach; unripe plums you can buy at the grocery. Your best option is to net the tree. Bird netting is readily available at any hardware store, and not that difficult to put over a tree, especially with a helper. If the netting snags too much on the leaves and branches, and you're feeling ambitious, buy some very long pieces of PVC pipe and some fittings, and fashion them into a frame over your tree. You can then easily slide the netting up over the frame, minimizing the snagging. When you net your fruit tree, be certain that there are no gaps in the netting, and that the netting goes all the way to the ground; weight the ends of the netting with stones or bricks. If there are any gaps, the birds will find them, get in, and peck the fruit (Exhibit A, above). Perhaps more importantly, any birds that get in will find themselves tangled and trapped in the netting, and you will be obligated to cut your netting to set them free or they will die. And yes, you must cut them free. I had a visiting Chihuahua get caught in bird netting once, and had to think long and hard about it, but that's a whole 'nother story. Tomatoes have been much in the news as of late, and none of the news has been good. It seems that we spend the better part of our childhood convinced that vegetables are bad for us, only to spend our adult years learning that we were right all along. So here's a little something to cheer you up: the first tomato of the season. Yes, that beautifully misshapen blob of bright red tomato came out of the garden yesterday afternoon. And just in case you suspect that I might have hired a stand-in tomato, take a look again at the picture I posted in May of the first tomato to set fruit. Sure enough, the self-same tomato, now approximately 20 times larger; it grew to about 5 and one-half inches long. It would have done well to spend just one more day on the vine, but rarely does the first tomato make it to full maturity here at the Ranch; the fact that it lasted long enough to be photographed was unprecedented. As you look to harvest tomatoes, wait until you're absolutely sure they're ripe — and then wait one more day. But do remember that things move fast in the Desert Garden, so don't wait too long. From fruit set to maturity, this tomato zipped along in 38 days, including a period of unusually cold and wet weather a couple of weeks ago. There are many arguments in favor of home-grown vegetables, but one of the best is this: rarely if ever do they kill you. And, really, what more could you ask for in a vegetable? Our little quince is growing up. It's hard to see, because it's still small, but it's becoming heavier and starting to pull down a bit. If you look to the upper right of the photo, you can see the twig to which it is attached; in the previous photos, that was hidden behind a leaf. The quince has an unusual fruiting pattern. Rather than forming flowers and fruit along its branches, or at the tips of short "spurs," the quince forms its fruit from terminal buds. Terminal buds, as the name implies, form at the end of a branch or twig. This has practical consequences. Deciduous fruit trees — which, in the Desert Garden generally means apples, plums, peaches, apricots and quince — are among the few trees that we prune on a regular schedule. We prune them for ease of harvest, to encourage fruit instead of vegetative growth, and sometimes so it's easier to get bird netting over the top of them. Each type of deciduous fruit has a different fruiting pattern, and we need to learn that fruiting pattern so that we avoid pruning off the fruiting wood and eliminating the harvest. When you plant a deciduous fruit tree, it's worth taking the time to find out what kind of wood it fruits from; it's easy to tell for the most part: in late Winter, the vegetative growth buds will be slim and narrow, while the incipient flower buds are rounder and fatter. With the quince, had I decided last winter to shorten all the terminal growth of the tree, I would have pruned off all the fruiting wood. Because this particular tree has only been in the ground just over a year, that might have been a good idea; it would have helped to strengthen the tree structure by allowing it a full year of growth before it had to expend energy setting and ripening fruit. But then we wouldn't have our little quince to watch every week. A picture, as they say, is worth a thousand words. But I won't let that stop me from adding just a few more words to the total. One of the interesting things about growing corn is that it grows hidden within a husk. As with potatoes, or turnips, or beets growing underground, you never really know what you're going to get until that moment of harvest. You twist the corn cob off the stalk, carry it indoors and rip open the husk. And not until that very moment do you really know what's inside. It might be rows of kernels that never pollinated; it might be a fat and happy caterpillar waving at you from it's cozy lunch counter. Or it might be what I found on opening the first two ears of corn to come out of the corn patch this season (above). What you see when you open an ear of corn is the result — the vegetable expression, if you will — of every shift and change in the growing season: the blistering hot day in the middle of silking, the unexpected rain, the windy week right after tasseling, those few days when you forgot to water. Every shift and change is written in the rows of kernels encircling the cob. The corn in the picture tasted every bit as good as it looked. One of the frequently expressed concerns in the Desert Garden is: "I have ants eating my plants." And the standard response, delivered by myself and others with perfect confidence, is: "Don't worry, the ants aren't really eating your plants; they are on your plants but not causing any damage. Ants don't eat plants." Guess what? I have ants eating my plants. My eggplants, to be specific. Not being at first certain that they were really doing what it looked like they were doing (cutting stems, severing leaves, drilling holes in the eggplant fruits), I hunkered down and watched them for the better part of an hour. I have ants eating my plants. If you click to see the enlarged version of the picture above, you can see the ants clustered at the terminal shoot of one of my eggplants; the leaf towards the back has been mostly severed and will shortly shrivel up and die. I collected samples of the ants and forwarded them to the Bugman at the University of Arizona, Carl Olson, and I'll let you know what he has to say about the type of ant this is. Ants, as a general rule, don't damage plants. This bunch apparently didn't get the message. Learning about plant pests and diseases can be a valuable part of gardening, but we sometimes run into the same problem with plant health research as we do with people health research: the more general the symptoms and the more gruesome the disease, the more convinced we become that — sure enough — that's what we have. Goodbye cruel world! The Desert Garden disease that is most likely to cause this kind of concern is Cotton Root Rot, also called Texas Root Rot. The scientific name is Phymatotrichopsis omnivora and it's that "omnivora" part that really worries us. P. omnivora is a soil-borne disease that attacks a wide range of plants, there is no way to diagnose its presence in the soil other than to have a plant die, and there is no cure. The symptoms are very general: plants suddenly wilt and die, or they slowly wilt and die; they wilt and die in hot weather, or they wilt and die in cooler weather; the fungus is present in the low desert, and in the high desert, and in many different soil types. I would comfortably wager that there is not a single gardener in the Desert Garden who hasn't had a plant inexplicably wilt and die during hot weather, cool weather, or somewhere in-between. And then we look for answers. And what we frequently find as we search is Cotton Root Rot. And we read that the only visible sign of the disease is a white or tan fungal mat on the soil surface that looks like spilled pancake batter. And then sometime later we see a fungal mat that looks like the one in the picture above. And then we know: we're doomed. Nope, don't worry: that photo above is of a perfectly harmless fungus that appears on the soil surface in warm weather after a bit of rain; it helps decompose organic material and return nutrients to the soil. I get asked about that fungus three or four times a year, so this year I'm making a pre-emptive strike: that is not Cotton Root Rot. You can see the real fungal mat for P. omnivora here. Other than having an expert carefully examine the fresh and intact root tissue of your dead plant under magnification, there is no way to tell if P. omivora killed your plant or if it's present in the soil. If you suddenly lost a plant, there's a very good chance the plant just up and died. Sometimes that happens. I have some critter that loves to dig in the bark mulch at the edge of the sidewalk. Mostly he digs holes and spreads the mulch on the sidewalk. In one night, we can have 10 or 12 holes. I've also found holes in my flower pots! We do have a delinquent squirrel in the neighborhood. Could it be him? Or some other critter? Any ideas for directing him elsewhere? While it is possible that your delinquent squirrel is causing some of the holes, your mention of the holes being at the edge of the sidewalk and in the flower pots makes me think the main culprit is a desert critter of the avian type: the Curve-Billed Thrasher. If the holes weren't consistently on edges or in pots I might think you had other birds seeking dirt baths, but the edges fit the Thrasher's modus operandi. The Curve-Billed Thrasher is native to the Desert Southwest and is notorious for digging holes in the ground at the edges of pavement and in pots. The good news is that all the digging is undertaken in the quest to eat grubs and other potentially harmful larvae. The bad news is of course the mess. The other good news is that their mischief is somewhat seasonal, so you shouldn't have to deal with them year-round. Some years I have seen them empty every pot on a property while in other years they do almost nothing at all. For the pots you can try putting down some chicken wire, or some decorative stones, but, for the landscape, any barrier just moves them to the area next to the barrier. As for moving either the birds or the squirrel elsewhere, we run into one of the realities of nature: when we create the conditions that attract and support a certain kind of critter — whether squirrels, birds, bugs, or graffiti artists — then that kind of critter will move into the conditions that we created. In the urban landscape we tend to forget that, but it works every time. Our challenge then becomes balancing our enjoyment of the landscape we've created against the nuisance of the other critters who enjoy the same landscape. If you like the landscape you're creating, then it's probably worth the mental exercise of accepting that some critters with annoying habits are going to want to share it with you. You could also try putting out little four-inch-high signs that have "no digging" written on them; it won't do anything to stop the birds and squirrel, but it will give the neighbors something to talk about. If you try this option, please send pictures. Our intrepid quince is a strikingly bright apple-green color. We can't actually see that bright green color because of the light tan fuzz on the developing fruit; it's pubescent. Nope, that doesn't mean it's become a teenager. In reference to plants, the word pubescent indicates the presence of fuzz, or soft short "hairs." Although it doesn't show much, the leaves of the quince are also slightly pubescent. Pubescence is a valuable trait in desert-native and desert-adapted plants. Intense sunlight, lack of moisture, and drying winds are three of the constants in a plant's effort to survive in the Desert Garden. Pubescence, the presence of short dense hairs, helps with all three. As small as they are, the hairs provide significant shade to the plant surface, each one casting a tiny little shadow and reducing the direct exposure to sunlight by around 50 percent, depending on the plant. Additionally, the fuzzy surface slows the wind velocity over the surface of the plant, helping to prevent the loss of scarce moisture from the plant tissues. Of our great native species, Brittlebush (Encelia farinosa) and Globe Mallow (Sphaeralcea ambigua) come to mind as markedly pubescent plants. The little hairs on our little quince rub off easily and we could remove them to see what would happen, but I suspect that would result in a stop-action of an entirely different kind. Sure, it's just a vegetable, but how does it get to be a vegetable? And by how I don't mean its history or its preparation in the kitchen (NB: steamed with a little butter is nice), but rather how it comes to have food value. In essence, a carrot plant is an energy collection, processing, and storage mechanism. It spends its first season producing and storing energy in the form of sugars and carbohydrates, and then in its second season it uses all that energy to flower and reproduce. This pattern of growing and collecting energy in one season and then expending energy and flowering in the next makes the carrot a biennial. Its energy storage container — its battery if you will — is the familiar orange tapered root we call the carrot, much beloved of healthy snackers and cartoon rabbits. Although the carrot is storing all that energy and sugar for its own reproductive processes, we short-circuit the process by pulling the battery out of the ground and using that energy for ourselves. Were we to leave the carrot in the ground, it would use all that stored energy to send up a fairly large flower stalk from which would grow hundreds of tiny white carrot flowers ready to form new seed. The carrot root, then depleted of almost all its sugars and carbohydrates, would be dry, tasteless, woody and, from our perspective, useless. From the carrot's perspective — if it had a perspective, which it doesn't, because it's a carrot — that would be the perfect outcome. Reproduction in one form or another is the purpose of all plant activity. We are successful in converting plants to food when we find the right point at which to divert a plant's energy from its purposes to our plates. We don't eat every carrot of course, or there would be no more carrots. And we also don't normally think of Ladybugs as pollinators, but the one pictured above was fairly well coated with white carrot pollen and was undoubtedly doing her part in creating new carrot seed as she frolicked about on the flower. One of our best-known and finest desert genera has an energy-storage scheme strikingly similar to the carrot, and some species also get pulled before they can flower, albeit for a rather different purpose. The first person to send me an e-mail correctly identifying that Desert Garden plant gets a packet of Ladybug-pollinated carrot seed in return (provided, of course, that the Ladybug did her job).